Are you are looking for new ideas for your business meetings? If you’re celebrating, it’s going to be a special, significant event that means a great deal to the company and its employees. As it is such a unique occasion you’ll need to make sure that the budget is well spent and that it’s a memorable event for all the right reasons. VanDutch Charter offers a new service that is right for your company. VanDutch Charter can represent your business and VanDutch Charter will help you to organize your events. Rent a VanDutch for Team Building and Incentives: Stimulate and motivate your team by giving them a company fun day out in a VanDutch boat. If you invest time, effort and money in your employees, your company will be rewarded with better productivity by enthusiastic, hard-working staff. The Côte d’Azur offers several ideal options, for example: On board several VanDutch boats to follow yacht races on the French Riviera; Or a relaxing day to unwind and reward your team; How about a discovery day or a treasure hunt on board a VanDutch boat? VanDutch Charter for conferences, seminars and workshops: Start your conferences on the Côte d’Azur with extra sparkle by renting a VanDutch boat that can whizz your team from their point of arrival to their hotel and events in style. Your guests will never forget the VanDutch experience. Take your team to the Lérins Islands, in Cannes Bay, or visit the monastery of St. Honorat Island and taste wine made by the monks. Another trip could be to St Marguerite island, the home of the Man in the Iron Mask, or lunch or dine in the Guérite restaurant on the island. VanDutch Boat Charter for client entertainment and promotional events: Give your customers a day out on a VanDutch, and follow the regattas on board a VanDutch. Every year, companies rent a VanDutch boat as a way of thanking their customers by taking them to the Voiles de Saint-Tropez, or the Royal Regatta in Cannes. An unforgettable experience that adds value your client relationship. For special events, charter one or more VanDutch boats to take your guests to the reception venue. Promoting or launching your product or your business? Imagine renting a VanDutch boat with hostesses on board to impress and look after your guests. Publicize your product or service by visiting the yachts moored in Monaco, Cannes and Saint-Tropez. 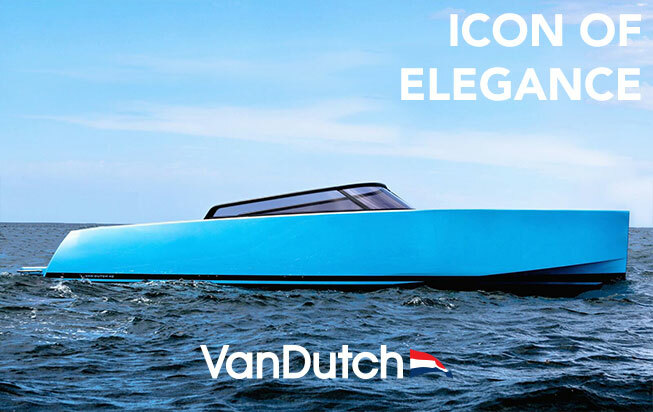 If you would like to customize the VanDutch boat with your company colours, send us your logo and we will display it on the hull. Gaastra, Petrossian, RedBull, France Yacht Magazine, Amber Lounge, Merle Wood & Associates and many others have all trusted us and have been very pleased with our service.